Next week on EWTN’s encore presentation of “Where Heaven Meets Earth,” see how the Seraphic Sisters of the Eucharist inspire young girls at Saint Peter Parish, at 3AM & 6:30PM eastern / 2 & 5:30 central, Wednesday, July 31 -- only on EWTN. On April 30th 2013, Sister Clara Maria and the Seraphic Sisters of the Eucharist made their EWTN debut in StoryTel's latest documentary, "Where Heaven Meets Earth." Audiences fell in love with her big smile and motherly warmth, commenting how appreciative they are that the Sisters work with the youth at Saint Peter Parish. Saint Peter’s Pastor, Father Cook, relates the Sisters role at the parish to the role of a mother, and Associate Pastor, Father Weidner, calls them, “the lynch pin of the whole thing.” Even in this short clip, Sister Clara’s kindness and charity shines through and it's easy to see how these Sisters, and this "joyful cherub", might inspire young girls to consider the cloistered life. If you'd like to reach out to the Seraphic Sisters, you can contact them through the Seraphic Sisters website, write a letter, or even pay them a visit if you're in the area. Tune in to watch the Seraphic Sisters of the Eucharist at 3AM & 6:30PM eastern, Wednesday, July 31 -- only on EWTN. Subscribe to StoryTel Updates and be the first to receive videos, trailers, and other exclusive content. EWTN Premiere Tonight of "Where Heaven Meets Earth, Restoring the Sacred at Saint Peter Church"
Reminder to watch EWTN tonight at 6:30ET, 5:30CT for the world-wide television premiere of "Where Heaven Meets Earth, Restoring the Sacred at St. Peter Church"
We've had considerable traffic to the WHME microsite recently. In fact in two short weeks, we received over 2.6K Facebook Likes for our trailer and thousands more people watching it across the globe. So, thank you to those who have so graciously shared the story of St. Peter Church in Omaha and helped to promote "Where Heaven Meets Earth" to Catholics all over the world! If you know someone who hasn't seen the trailer or heard of the documentary yet, consider sharing this uplifting story by sending them to www.heavenmeetsearth.tv or sharing a copy of "Where Heaven Meets Earth" on DVD. Visiting storytel.org/order where we give away DVDs for a free-will, tax-deductible donation. Click the PayPal donate button and fill out your payment information. On the second page of the payment process, type "Where Heaven Meets Earth DVD" and the quantity you'd like into the "Special Instructions to the Seller" section. Standing Room Only at BIG SCREEN Showing! They laughed, we cried. It was so wonderful to see our hard work connecting with the audience. Very excited for the World-wide Television Premiere on EWTN, Tuesday April 30th at 3am & 6:30pm Eastern. Visit our Facebook Page to see more pictures of the BIG SCREEN showing at St. Peters Gymnasium on April 14, 2013. 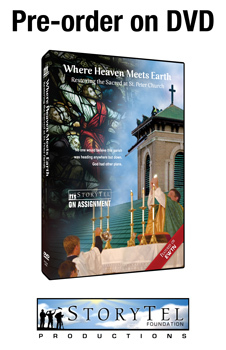 Pre-Order "Where Heaven Meets Earth"
We're now taking pre-orders for "Where Heaven Meets Earth, Restoring the Sacred at St. Peter Church." But, we're already down to 457 DVDs from 500 to pre-order -- and they are going fast. Visit www.storytel.org/order to reserve your copy today. Setting up in St. Peters Gym on Satuday! The 9x16 screen makes for a great theater atmosphere. Things are ready for Sunday's BIG SCREEN showings. StoryTel, a private, non-profit media foundation dedicated to inspiring viewers to restore the sacred, announced today that its latest completed production, a $100K film project donated to St. Peter Catholic Church (St. Peters), of Omaha, Neb., will appear on EWTN, the Global Catholic Television Network on Tuesday, April 30, 2013 at 6:30pm ET. The documentary, named “Where Heaven Meets Earth,” investigates how this poor Omaha parish became a thriving and vibrant church again after more than 40 years of decline. It was created to entertain viewers around the world with an incredible, true story and spur them to action for God, the film has incidentally helped the parish raise $3 million and is expected to raise even more when it airs on EWTN, though it wasn’t intended to be a fundraising video. It's one of the many projects StoryTel has recently completed as part of the foundation's mission to, “inspire viewers to restore the sacred,” says President of StoryTel and “Where Heaven Meets Earth” director, Don Carney. “In a broad sense, restoring the sacred means embracing the whole of Catholic tradition,” said Carney. “So when we encourage people to restore the sacred, it can translate into anything from helping people to grow closer to God, or supporting the rehabilitation of physical structures like a church or school, to helping protect the life of a child in the womb. We work with many different organizations and causes to restore the sacred by impacting viewers with our films. Since its founding in 2008, StoryTel Foundation has worked on a wide variety of projects that are in some cases donated entirely to the organizations with which they work. Their documentaries, fundraising videos, and web videos have helped raise funds and other crucial support, always encouraging new connections with Christ. “Where Heaven Meets Earth,” a $100K-documentary film project, produced and donated by StoryTel, not only relates St. Peters’ history, decline and current state, but has also moved donors to support the parish’s massive restoration effort. The documentary is part of StoryTel’s “On Assignment” series, which is the foundation’s investigative TV series produced for public broadcast and DVD distribution. Initially commissioned for the church as a three-minute video to highlight the parish rebirth, StoryTel Foundation decided to expand the documentary for their TV series when they discovered what an amazing story the parish’s journey had become. The story of St. Peters‘ rise to new life is not only interesting it is incredible. The documentary film project was a perfect fit for StoryTel Foundation. While interviewing Father Cook for the “Where Heaven Meets Earth,” Carney learned that, interestingly enough, it was a DVD of StoryTel’s documentary, “St. John Cantius, Restoring the Sacred” that actually inspired Father Cook to visit St. John Cantius in Chicago while on a trip, and moved him towards his effort to renew the aging St. Peter Church building. It is in this way that StoryTel’s work seems to have a ripple effect that extends far beyond the boundaries of a single film or fundraising project alone.